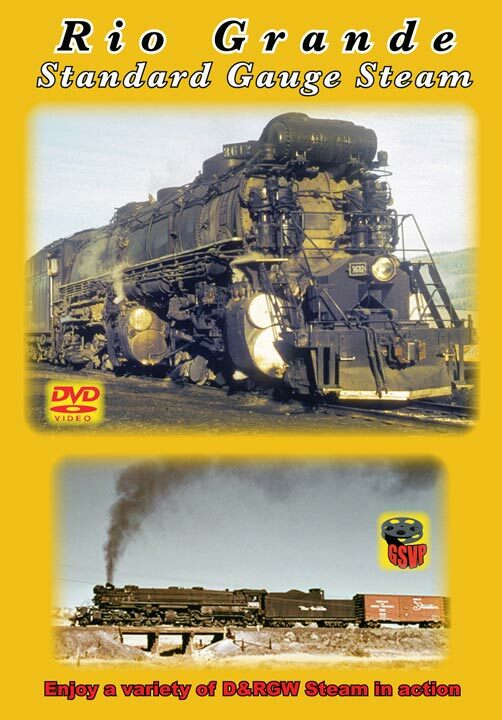 While there is a lot of Rio Grande Narrow Gauge film, Rio Grande Standard Gauge Steam is harder to come by. 1956 was the final year for standard gauge steam through the Rockies of Colorado and Utah on the Denver & Rio Grande Western Railroad. This bridge railroad handled freight and passengers mainly between Denver and Salt Lake City. This included the original mainline from Pueblo over Tennessee Pass to Minturn, and also the line through Moffat Tunnel that was originally the Denver & Salt Lake Railroad. We will see a variety of locations covering a little bit here and there throughout the system in this show. Locations include Minturn as we watch a 2-8-2 switch and refrigerator cars being iced during this time. Then we ride a passenger train up Tennessee Pass with a 4-8-4, and a 4-8-2 helper, and ride to beyond Salida. We stop in Salida later to enjoy some moves around the yard and engine facility including several L class 2-8-8-2's. Besides a 2-8-0 switching we also see the "Royal Gorge " passenger Train arrive with a 4-8-4, and a narrow gauge engine leaving for a branch line. Next we head west toward Tennessee Pass and see a 2-8-8-2 on a freight and then we are in Utah for a couple of scenes with Challenger 4-6-6-4's in action, including Soldier Summit. Next we backtrack a bit to Grand Junction and see the a diesel passenger train arrive(California Zephyr), and then see a 4-6-0 on a lessor known passenger train. From here we head to Tabernash, and see 3609 in rear helper service to Moffat Tunnel. Then we are riding the California Zephyr through Moffat tunnel and see a 2-8-8-2 on an empty coal train at the east portal. Next we visit Denver for a 2-8-0 switching, then the roundhouse where we see an L-series 2-8-8-2 being readied for action. Next we see this engine, number 3612 as a rear helper heading south toward Colorado Springs. Then we see a different train at Palmer Lake being serviced, and heading southward to Colorado Springs. A visit to Pueblo is also seen with action around the engine facility and passenger depot. We then see a rare train on La Veta Pass with a mid-train helper. These are older articulated engines than the newer L class engines we saw previously. We move west toward Alamosa, but first stop at Blanca and see some rare footage of 2-8-0 number 106 in action. This engine turned out to be the only Rio Grande Standard Gauge engine saved(Now at the Colorado Railroad Museum). This footage was shot by Warren Scholl in 1954. At Alamosa we see a little of the roundhouse with a narrow gauge engine, and a couple of standard gauge 2-8-0's number 1136, and 1161. We then chase 1136 on a freight to Monte Vista, which includes some nice pacing scenes. There is a ton of material packed into this show, and its fast paced, with not too much time spent in any one area, although a lot of areas are covered. This footage was from at least 6 different sources, and we have been saving a lot of it for years trying to accumulate enough to make a decent program. As most of these films, there is no live audio, so we don't try to mess it up with fake audio. We have a ton of informative narration and nice background music. These vintage shows take a huge amount of time and effort, so we hope you appreciate and enjoy it. 4:3 DVD. 38 minutes plus 30 more minutes of previews including Rio Grande Narrow Gauge and more. Steamboy (Revere MA US) on 2016-06-19 18:46:38. Well as Greg did a spoiler alert on how the paragraphs goes, I'll say this is indeed a must have since Greg owned all of the rare silent films since he was part of a rio grande narrow gauge club.